Notable news items and price action from the past twenty-four hours, as well as our fundamental view on select names. JACK reported 2QFY11 earnings last night, missing EPS expectations of $0.20 with a print of $0.12. Revenues were ahead of expectations but commodity cost guidance was raised for the year. 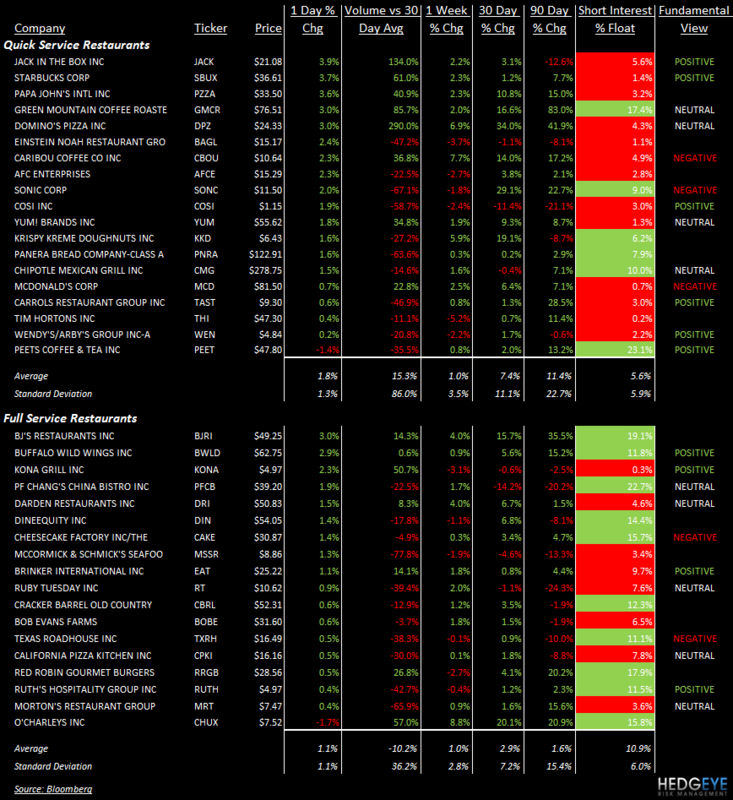 Jack in the Box comp guidance range midpoint was raised 200 bps and Qdoba system comp guidance was raised 100 bps. MCD this morning announced a quarterly cash dividend of $0.61 per share of common stock, payable on June 15, 2011, to shareholders of record at the close of business on June 1, 2011. MCD is being called upon by a campaign group called Corporate Accountability International to bad Ronald McDonald and Happy Meals because they attract children to junk food too much. SBUX is being sued by the US government for firing a barista because she is a dwarf. The US Equal Employment Opportunity Commission said that Starbucks violated federal law by denying a reasonable accommodation to the employee. JACK, SBUX, PZZA, GMCR, DPZ, CBOU and YUM all saw their stock prices gain significantly on accelerating volume yesterday. BJRI, BWLD, KONA, DRI, and EAT gained on accelerating volume also. CHUX was the only restaurant stock to decline on accelerating volume.